The standard pulls sent with the Brain Bag are nice but when it comes to cord I usually can't leave it alone. I've got to tinker and customize. So what I've got on the bag now are pulls in a cornucopia of colors and textures to intrigue your senses and stoke the fires of your passion for adventure. Anywho, It was a bit difficult to get a good shot of all the pulls at once in the confines of my lightbox. I may have better results in a day or two when the sun comes back out in these parts. I went with a different color and knot on each section of the bag. Aside from the visual variety it aids in differentiating which part of the bag you're opening. 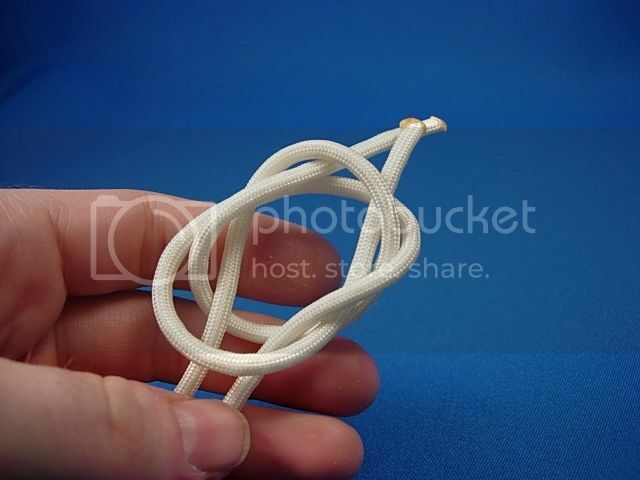 The back large compartment has a two strand footrope knot. The other large compartment is done with a wall knot (four layers worth). The front organizer pockets have a double overhand knot. The small top pocket got a two strand stopper knot accented with a brass bead from Rick Hinderer. I'm happy with how they came out. I may tack them with super glue to prevent loosening where they are looped around the metal pulls but some use and break in time is needed first to see how they ride. Very cool! Love your avatar too - I grew up in LA during their prime. these are awesome. now, you need to make them available to the less-handy and gifted of us! Any chance you could post instructions or a video on how to do this? Thanks! Last edited by bbpmdj; 02-24-2013 at 08:45 AM. Those look great! I got some titanium beads from CountyComm a couple months ago and have been considering doing something similar to your last pic if and when I get my Smart Alec. Got a somewhat improved picture of the whole bag today. 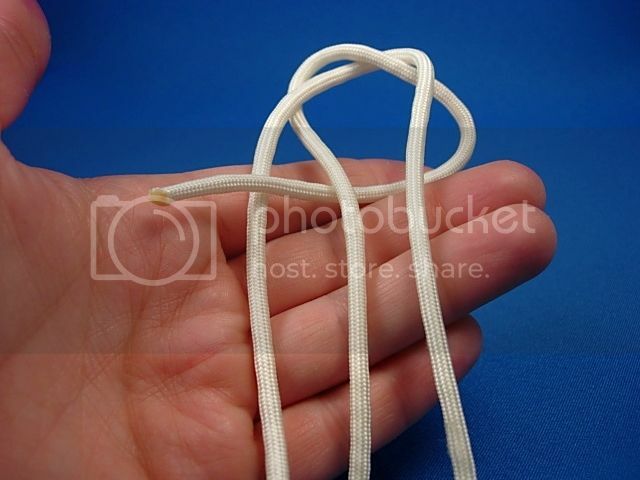 As for how to tie these, whatever is already on the net for instructions will probably be better than I can provide. Be aware that the knots will require some massaging and working out the slack to look neat and finished. Practice and patience are needed. 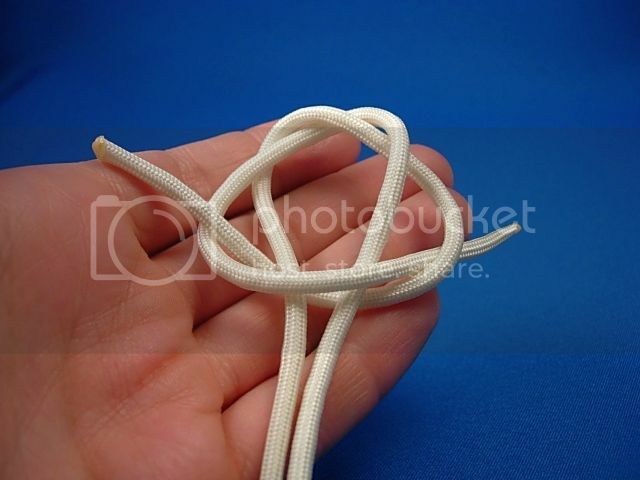 The double overhand is just what name implies - an overhand knot that loops around twice instead of once. This links shows doing it with one length of cord rather than two as in the pull. 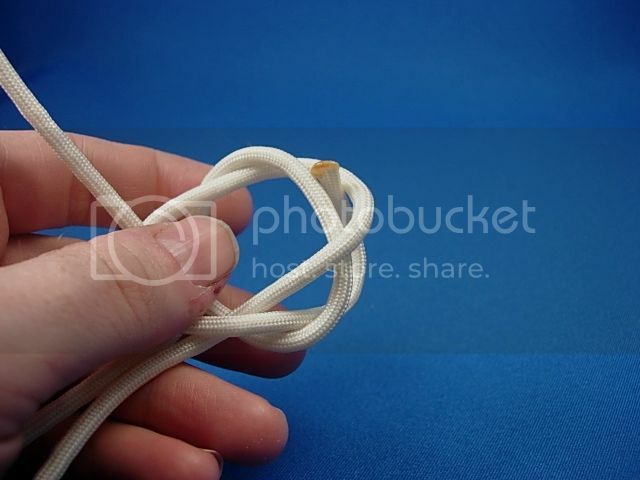 I prefer the alternate method shown for tying this knot. The wall knot can refer to different things. What I've called the wall knot here may also be referred to as the snake knot, though I think of the snake knot as having the additional step of being woven back on itself to create a thicker and more rigid structure. Very simple to tie and you can easily make it as short or as long as you like. 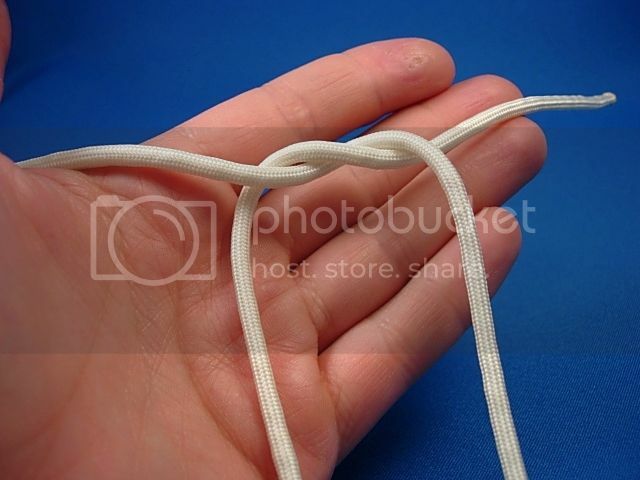 The two strand stopper knot starts the same as the wall knot but the ends are sent back in again through the middle and out the top. I wasn't able to find much for the two strand footrope know while googling around, so maybe I can do pictures for that one at a later time. Last edited by jujigatame; 02-24-2013 at 05:46 PM. Oh wow! Awesome knots! They inspired me to pull my knot tying book off the shelf and thumb through it. Where do I find paracord? If there's an Army/Navy store in your area they may well have paracord in black, OD, tan and some camo colors. Outdoor retailers may carry it as well in a few colors but quality can be hit or miss. If buying online Supply Captain has a good selection and goes for around $7 per 50 foot hank. At other places you could buy smaller quantities but you'll likely end up paying more per foot. Today was the first day out with the Brain Bag. I had it packed for an overnight stay. There's more in here than I really needed but it was about 15 lbs. I stopped to run a few errands on my way and took the bag with me at each stop to get some time carrying the load. I find that the bottom of the bag ends up well short of my waist. I have a longer torso and shorter legs so this is not unexpected but in order to get the weight lower toward my hips the shoulder straps can't be as snug as I might normally have them. This throws the balance off somewhat. More time and adjustment will be needed to see if I can get a fit that feels right. I took a few more pictures for your viewing pleasure. Replaced the standard black key strap with one in storm blue. I put a looploc on the top front lash strap to keep it place. 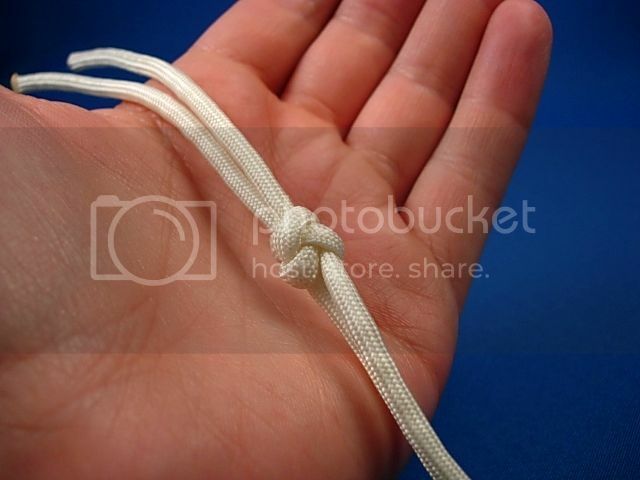 Here’s a step-by-step on how to tie the two strand footrope knot. 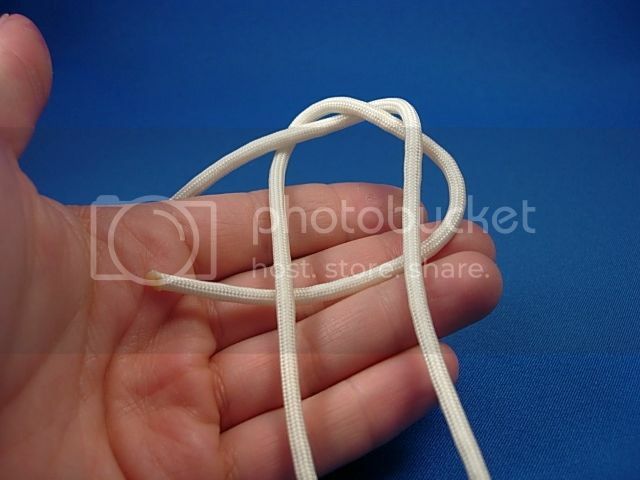 1)	Cross the ends as shown, just like tying a shoelace. 2)	Take the right side end and cross it under the two standing parts in the middle. 3)	Take the left side end and put it under the end you just brought over from the right. 4)	Now take that left side end, cross it over the two standing parts in the middle and then through the bight on the right side. 5)	Take one of the ends and slide it up in between the strands at the top of the knot. 6)	Do the same with the other end. 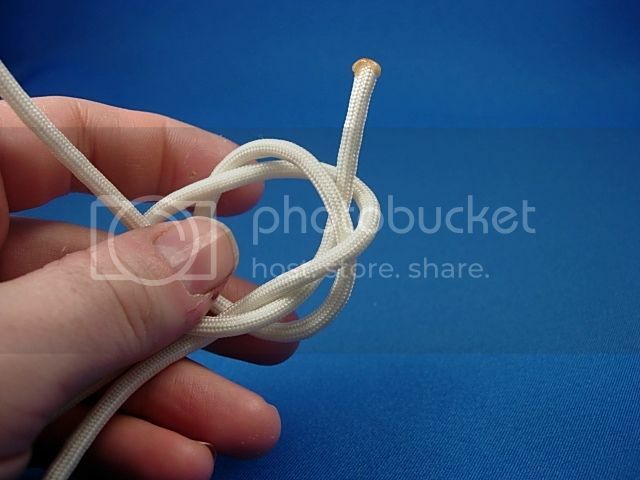 7)	Now pull with even force from both sides and the knot will begin to take shape. 8)	Continue pulling until tight. You may need to work some slack out to get all of the faces even. The end result will look like this. There is another way besides glue to create a more "non-slippy" attachment than the ring hitch. This way it won't slip around as much as the ring hitch, while not adding much bulk at the attachment point. Many thanks, Jujigatame, for the idea and link to tutorials; here are some 8-layer wall knots (or snake knots) in turquoise 550 paracord that I tied on our new black Dyneema Daylight Backpack that is accompanying my daughter to Oahu next week. I used 2' lengths for these. Now I only wish that I had some TB turquoise accessories to match…..
Those look good. Glad the links were useful to you. The one from the Tom Bihn video is a little big in my opinion. An Island PCSB (which goes on sale tomorrow!) will fit beautifully in the DLBP! Thank you, jujigatame, for providing photos of both your color-coordinated paracord knots on your Brain Bag backpack and for showing us your backpack while it is being worn. 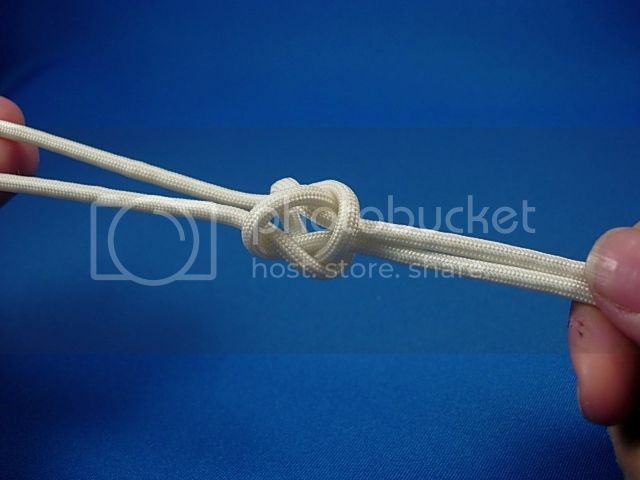 Also thanks for providing the links to knot-tying videos for us to learn from. Very much appreciated. Owner of: Brain Bag backpack (Black), Field Journal Notebook (Blue), Snake Charmer (Small, Orange), Super Ego briefcase (Black / Indigo / Steel) with Reflective Strip, Brain Cell (Steel), Horizontal Freudian Slip, various Organizer Pouches and Key Straps, and a Side Effect (Black / Wassabi) worn as a belt-style hip-pack.